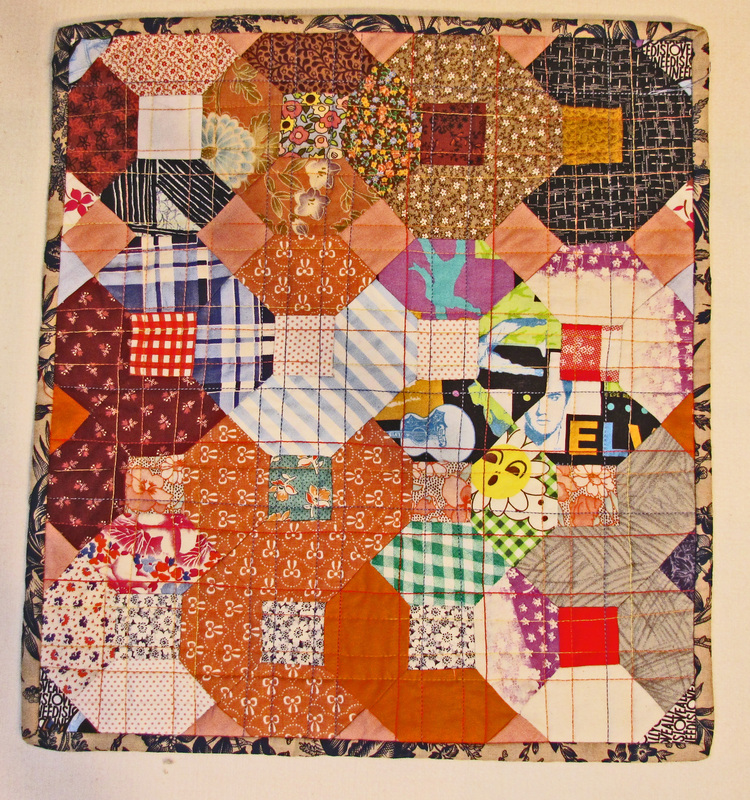 The local quilt guild announced a challenge to choose something from the book ‘20,000 Leagues Under the Sea” by Jules Verne for our September meeting. This involved reading the book–quite lengthy and lots of imagery. The Nautilus was based on Robert Fulton’s vision of a submarine powered by a set of sails. Verne’s submarine did not have sails nor did it have the power to refresh it’s air, needing to surface from time to time. I chose the time when Nemo decided to explore the Antarctic and got stuck underneath the ice–ice with ribbons of color through it. I haven’t finished the piece yet–still has an image of the Nautilus to be improved upon at the bottom and of course, some quilting–or maybe a lot. 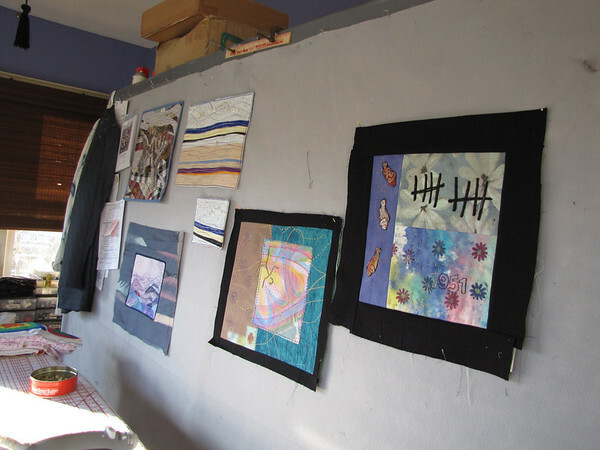 While routing around in my boxes of fabric–my palette–I found a piece started several years ago in a Nancy Crow workshop. I think it was about motifs and re-interpreting them. I don’t think they were supposed to be sewn together–but I think it might make a good base for an upcoming exhibit called ‘forced to flee’. Hurricane Harvey/Tropical Storm Harvey inundated us with rain–so much water we became quite literally an island unable to go west,east, or north and to the south was the ocean. Many people were rescued from their homes via the Cajun Navy and National Guard Reserves including my youngest son and his family. I am planning to put some lettering and imagery on it–but not blatantly. I want the piece to reflect–the decision–stay or go…go or stay—rebuild or leave–to the many different options available after some time has elapsed. More on this piece and the 20,000 Leagues Under the Sea later. This little piece was made from many fabrics from my mother’s scrap bag. 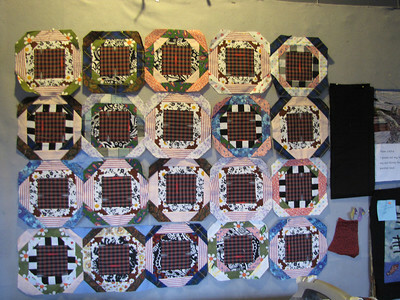 I hand-pieced it and ended up modifying the pattern somewhat as I worked. It is supposed to have a center square surrounded by four oblong pieces; each resulting piece is then connected to the next one by another square, slightly smaller than the center one. I’ve made this pattern–Kansas Dugout=–in several sizes and still enjoy making it. A series is definitely intriguing. Several working Psalm illustrations on the left; a birthday piece on the right with three fish, 10 tics and 1951 written in the lower right side–my birthday.